Providing you the best range of renderoc plug, renderoc rg spl, renderdroc rgl (25kg) concrete repair, renderoc sp40 (25kg) construction material, nitomortar 30m (10l) concrete repair materials and nitoprime concrete repair material with effective & timely delivery. 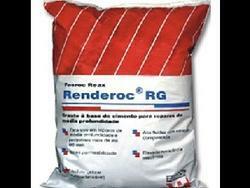 Renderoc RG Spl is supplied as a ready to use blend of dry powders which requires only the site addition of clean water to produce a free-fl owing non-shrink repair micro concrete. The material is based on Portland cements, graded aggregates and fi llers, and additives which impart controlled expansion characteristics in the plastic state, while minimising water demand. The low water requirement ensures high early strength and long-term durability. For larger repairs, the mixed Renderoc RG Spl may be modified by the addition of 5mm to 12mm clean, graded, saturated surface dry aggregates at site. 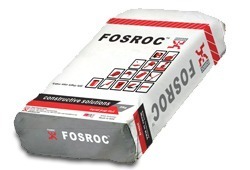 For exceptionally large repairs, the local Fosroc offi ce shall be consulted. Cost effective, General purpose, non-shrink, cementitious microconcrete Uses For economical repairs to damaged reinforced concrete elements, particularly where access is restricted and where vibration of the placed material is difficult or impossible. Suitable for various structural strengthening measures such as filling honeycombs and cracks. Advantages „ Gaseous expansion system compensates for shrinkage and settlement in the plastic state. „ Can be pumped or poured into restricted locations. „ Highly fluid to allow for placement without vibration. „ Pre-packed to overcome site-batched variations. „ Low permeability „ Economical „ Contains no chloride admixture. „ Ease of use. Defi nable performance - positive benefi ts are easily demonstrated via a single, simple measurement. Chemical and abrasion resistant epoxy repair compound Uses For permanent repairs to concrete structure and cementitious substrates where strength, impermeability to water and resistance to aggressive chemicals is essential. 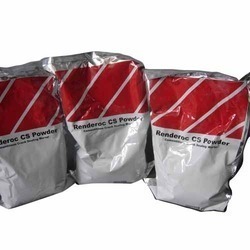 Ideally suited for maintaining engineering, chemical handling and processing plants. Advantages  Chemical Resistance : Unaffected by wide range of acids, alkalis and industrial chemicals  Easily applied : Designed for easy application to a fair finish  Quality : Pre-weighed quality controlled materials ensure consistency and reduce risk of site errors  Proven performance : Successful use proves for a wide variety of aggressive applications Description Nitomortar 30(M) is a three part solvent free combination of epoxy resin, modified amine hardeners filled with specially graded chemically inert aggregates with high crushing strength. 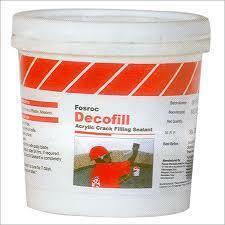 It is applied by trowel as a durable chemical resistant repair mortar 5 - 10mm thick depending upon the requirement. The system includes Nitoprime 25 a two part epoxy resin primer and Nitomortar 30(M) which are both supplied in preweighed units ready for onsite mixing and application. The finished area has a slightly granular texture of uniform self colour. However, as the natural grade takes its colour from the aggregates which is subjected to variation, colour matching is not practicable with this grade. Uses Nitoprime 25 is suitable for priming concrete surfaces prior to the application of any of the Nitoflor SL2000/4000, TS / TF range of resin based floor toppings, Nitocote range of protective coatings or Nitomortar range of epoxy repair mortars. Advantages „ Can be applied even on damp surfaces „ Improves the adhesion of epoxy floor toppings and mortars with the substrate. Description Nitoprime 25 is a two component epoxy based primer with good penetrating properties for concrete surfaces. Technical support Fosroc provides a countrywide technical advisory service supported by a team of specialists in the field. Properties 200 C 300 C Pot life 90 mins 30 mins. Single part, non shrink, cementitious, crack filler for plaster, masonry and concrete Uses Renderoc CF is used for filling cracks on plaster, masonry and concrete substrates. Advantages Single component - Easy to use Versatile - Can be used for cracks in exposed conditions on plaster, masonry or concrete upto 20mm width Non sagging - Can be used for horizontal, vertical and overhead applications Good adhesion - Effective bonding with substrate Non Shrink - Shrinkage cracking eliminated Hydrophobic - enhanced waterproofing property Description Renderoc CF is a crack sealing/filling cementitious material in powder form. It is easy to apply and can be finished or smoothened off with a putty blade or a damp sponge. It sets quickly on application and can be over coated with common paints / coatings. Properties Colour White / grey Pot life 30 min Compressive strength 18 N/mm2 in 7 days and (ASTMC109) 20 N/mm2 in 28 days Fresh wet density 1.95 g/cc W/p Ratio 0.23 by weight Mix proportions by volume. Uses Wall / ceiling angles, cornices Door and window frame surrounds Fitted furniture Skirtings Staircases Replacement window installations Advantages Easy to apply and finish Excellent adhesion to most building materials Fast setting Non-staining Flexible seal Can be over painted or papered Description Decofill acrylic sealant is a white acrylic based gap filler in paste form for application from a cartridge. It is very quick and easy to apply and can be finished or smoothed off with a spatula or a damp sponge. It sets quickly on application and will accept paint or wallpaper finishes. Typical uses for Decofill acrylic sealant are gaps between skirtings, window and door frames, fitted furniture units and ceiling cornices and adjacent plaster work. Where replacement windows are installed Decofill acrylic sealant can be used to make good between new frames and interior plaster work. Fairing mortar screed, to cover surface imperfections, polymer modified (0 mm to 3 mm thickness) Uses Renderoc FC cementitious fairing coat is designed for application in thin layers to produce a fair-faced appearance to concrete surfaces or masonry surfaces in readiness to receive a protective/decorative coating. Surface imperfections up to 3 mm in depth can be filled with the scrape coat application. Voids of greater depth should be separately filled as a prior operation, again limiting the Renderoc FC material thickness to 3 mm. Renderoc FC can be used independently to infill surface imperfections and voids or to render large sections of concrete or masonry at up to 3 mm thickness. 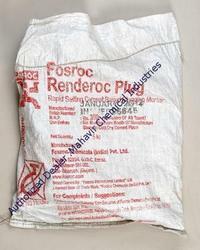 It can also be used in association with other Renderoc mortars. Under normal conditions, the product does not require an independent primer or curing membrane. 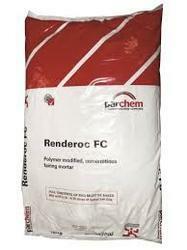 General purpose, non-shrink, cementi-tious microconcrete Uses Renderoc RG is used for repairs to damaged reinforced concrete elements, particularly where access is restricted and where vibration of the placed material is difficult or impossible. It is suitable for various structural strengthening measures such as encasement build-ups, jacketing etc. Advantages „ Gaseous expansion system compensates for shrinkage and settlement in the plastic state. „ Can be pumped or poured into restricted locations. „ Highly fluid to allow for placement without vibration. „ Pre-packed to overcome site-batched variations. „ Rapid strength gain to facilitate early reinstatement. „ High ultimate strengths and low permeability of cured repair. „ Contains no chloride admixture. 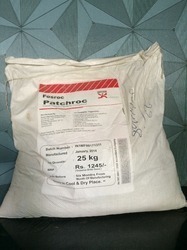 Uses Patchroc Standard has been specially designed to provide a fast set repair in concrete floors and pavements and is particularly useful where traffic must be kept flowing with minimum down time. Patchroc Standard will be of particular interest to industrial maintenance engineers, transport managers, airport authorities or anywhere that pot holes in concrete cause a hazard to pedestrian and wheeled traffic. Advantages „ Medium Fast setting - Minimum disruption to traffic „ Easy to use - Needs only the addition of water. „ Easy to lay - Very easy to apply & finish „ Non shrink - Does not crack „ High adhesion - Use Nitobond AR as primer ensures good bonding to concrete substrates. „ Durable & Tough surface - resistant to wear and tear. Looking for Concrete Repair Sealant ?